What equipment and tank storage is needed, how much space does it take up and where is it located? What is the FS MARINE+ Packaging? What is the Weight & Dimension of the solution? How long does the system take to be installed? Depending on ship setup app 3-6 days without Methanol Tank preparation and cable and pipe routing. Does the ship be stopped from normal operation, off-time for the installations? In general all installations could be done during sea voyage by a flying crew and the vessel not need to be taken out of service. Dry-Docking is not required in general. How the vessel need to be prepared for the installation? Are there any special safety requirements? Does the IGF Code requirements need to be fulfilled? Do engine mappings and parameters need to be adjusted? Are there any special crew educations / trainings /drills required? No any official external trainings to be arranged. The crew will be instructed and trained during the installation process. Crew and operator trainings could be arranged on demand. The solution works fully automatically controlled without any human intervention or special know-how of the crew. What are the operation/maintenance demands on the crew? Is there any impact on scrubber/EGR operation, given the decrease in combustion temperature? Use of FS MARINE+ potentially even provides therefore a faster amortization and ROI on a rubber / EGR system. When do you expect general approval from the main two- and four-stroke engine builders? How to/where do you inject the Hydrogen based synth gas in the engine? How much is the Hydrogen injection rate? How you make sure there is no harm to the operating engine? We are not replacing fuel by hydrogen as a piston engine is not meant for this and it would lead to “knocking” and damage the engine. We have confirmed by independent verifiers in reports and analysis by DNV GL and Carl Baguhn Hamburg (CBH) the positive effects on the engine behavior and even confirmed in the laboratory of Rostock (FVTR) that the FS MARINE+ does not harm the operating engine. How to/where do you inject the methanol into the engine? Can you reduce the OPEX even if considering the additional cost of the hydrogen based gas and methanol, etc.? Yes, up to 10 % NET OPEX savings will be reached easily by combined fueloil & lube oil- and maintenance cost savings as confirmed from independent third parties in real life operation over 2,5 years. How do we define the methanol storage tank size & approx. consumption? How much water is used by FS MARINE+? app 7% of the saved fuel will be replaced by water. Does FS MARINE+ require specific quality of water? The better the water the longer the lifetime of the electrolysis stack, however the system is monitoring water quality for the ideal system operation / lifetime and efficiency of the overall system. FS MARINE+ is designed to be used with distillate water, portable water or technical water. Other water is possible, but will require more filtration and monitoring for best system performance. Is there any performance monitoring / reporting included? A “full performance monitoring and reporting system” is part of the delivery if the system will be purchased with performance guarantee. Load and consumption parameters be recorded from all engaged consumers. 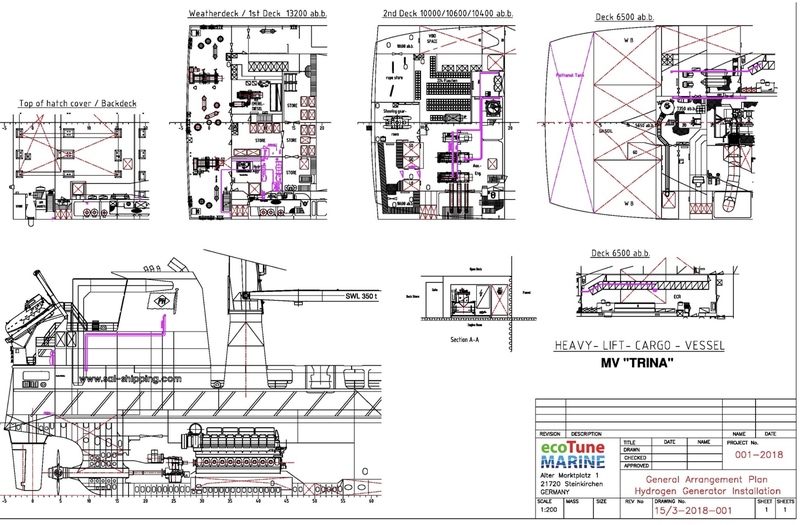 Offer Process / Approach – FS Marine+ Hydrogen Generator System? Packaging Options of FS MARINE+ and Re-usability for Investment Security? The delivery time for the FS Marine+ System from contract signing till delivery is app. 4-6 month depending on the ship design, class and flag state. Containerized solutions might be delivered on shorter notice depending on max. engine output. All pre-installation works on board have to be carried out in the meantime. Who will arrange the on-board preparation and pre-installation works? FUELSAVE GmbH and their partners will be able to supply a turn-key system including all required pre-inspections, system design, sub-supplier arrangements, design updates, delivery and transports, installations, testing, commissioning and approvals on board. How does the full scope of vessels upgrade will look like and how much time it will take? CUSTOMER (C) Return of the questionnaire ? C Proposal review, provide further technical information ? C Acceptance of pre design and budget quotation, sign LOI ? provide contract, technical description, performance guarantee wording etc. C & FS Contract negotiations ? C Provide further technical documentation ? descriptions, specification, maintenance instructions etc. Total delivery and installation process after contract signing for single deliveries app. 3-5 month subject to prior sales and current contract situation – handled on a first come first serve basis. Deliveries for repeating vessels or containerized solutions will be adjusted accordingly. How fast is the rollout? How many ships can be installed in parallel? We can scale assembly and rollout in a team of 2 and are able to scale for 100s of installations with our team and partners within 3 months from order. Can all types of fuels be used? FS MARINE+ can be used with gas engines, however the benefits for fuel savings and emissions reductions are significant less than in liquid fuel engines. In general it is observed that the worse the fuel quality the bigger the effect and benefits achieved by FS MARINE+ , while we indicate the net savings based on the best available fuel to have the most defensive approach and be on the very safe side with our savings commitment towards our esteemed customers. Are there special requirements for HFO? In order to perceive the real net savings an energy balance has to be taken into account considering the input material used for the generated output to get to real net savings. FS MARINE+ has been proven in real life to achieve more than 16% net savings, not even taking into account the additional savings from the reduced maintenance and longer lube oil use and positive cleaning effects on the engine, etc. What regulations FS MARINE+ had to fulfill for class & flag state until today? FS MARINE+ is monitoring all components and interfaces (for voltage / current / pressure / temperature, etc.) of the auxiliary systems and is able to interact with the alarm system to provide corresponding notifications / alarms to the ship operator. How about an Integration in Automation System? FS MARINE+ can be integrated in the automation system for automatic system startup after a short period of time where all parameters are checked and verified to be in line with the expectations. Does the FS MARINE+ system change the peak pressure in the cylinder during combustion? NO, please refer to the separate document detailing the testing series at FVTR in Rostock. What was the standard air-intake temperature in the test engine on the MV Annette and inside the laboratory? Does FS MARINE+ also function without hydrogen and only with Methane? NO, the positive effect to the ignition timing is related to the hydrogen injection only. The engine behavior improve and the combustion process extend to burn all injected fuel. How FS MARINE+ avoids Hydrogen concentration / collection in the engine room? As described above, the generated hydrogen quantities are very small and only produced on demand, directly injected & burned in the engine. Our safety systems prevents the production of hydrogen without running engine. Even if the engine would suddenly crash and immediately stop turning, there is no possibility of hydrogen concentrating above the critical limit of 4% in the charge air. Differences between results from Laboratory and Real-Life measurement? The results from laboratory differ significantly from real-life measurements, which is easy to understand in the context and with the background and objective of the FVTR test series. The objective was to see tendencies for emission reduction and that there is no harm to the operating engine, since net savings have been confirmed already in real life measurements and we wanted to make sure that no engine manufacturer can claim we are damaging the engine and that we have scientific proof for it. Therefore at no point in the lab test the real values for dosification and input media have been used as in real life, but a range has been tested from A-Z with certain undefined set points. The disadvantage is that 95% of the test series therefore looks naturally bad, as the set values are totally not correct and with the 5% the values are close but also not at all ideal. However is easy to understand as the whole range has been checked randomly and the tendencies could be seen. The advantage is that our specific set points and dosification values are not in the public domain and remain our specific IP. The tendencies shown and results achieved confirm the benefits achieved in real life measurements. In the test the FVTR used random setup points without ideal values for the input media, dosification and combinations of our FS MARINE+ system which we have intelligently configured through empirical know-how. The system has been tested through various random set points to get insights in the range and learn from the tendencies further aspects to be able to incorporate it and feed it back into the system design and configuration parameters. How can you be sure without using the real set points that there is no harm to the operating engine? We analyzed the range and set points that are beneficial and where is no harm to the operating engine and were able to confirm that FS MARINE+ operates well within these limits. How does an installation look like as example in the GA Plan? Where would a containerized version of the solution be located as example?